Visiting Halloweentown in October 2018 – What to expect? St Helens in USA Oregon is the popular Halloween town – the town which turns into a major crowd puller during the Halloween season. Thousands and thousands of people visit this beautiful town in the month of October for a taste of magic that only Disney can weave. However, note that though inspired by a Disney movie of the same name, the set up you will see here is not created by Disney at all. The concept was created and implemented by the people of this town who are keeping it alive year after year since 1989. ‘Halloweentown’ is a Disney TV movie which has reached cult status ever since its release in 1998. The movie was shot at numerous locations in Oregon, including the town of St. Helen’s. The movie hit a deep spot with the people of town and as a result led to the idea which helped breathe new life into St. Helen’s. The movie was so famous and loved that, three more installments were made later on! The people of St Helens loved the setup so much that they decided to recreate it every year for the fans to visit. The people of the town call this month-long celebration as ‘The Spirit of Halloweentown’. 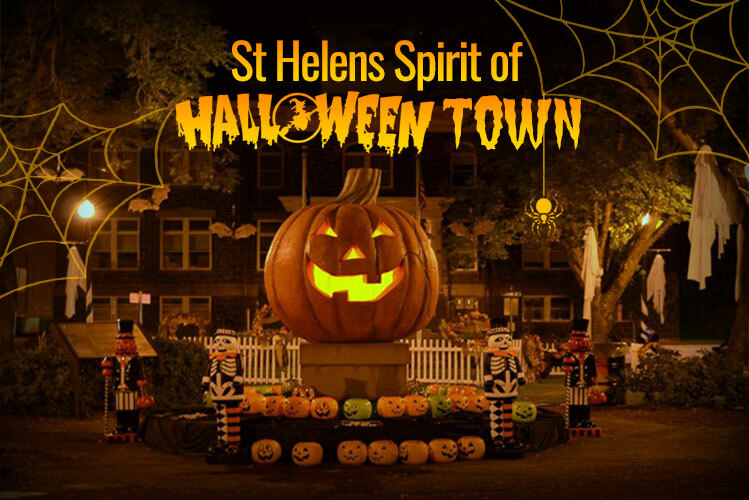 The event starts with St Helens Halloween Parade which was held for the first time in 2015. The parade ends in the old town’s historic district near the Columbia River for the community pumpkin lighting. The Great Pumpkin – the show stopper here – is the original one which was used in the movies. We won’t call it a highlight of the vent, but it is definitely a must-try ride. The “The Severed Head Tractor Ride” website states that the ride covers a scenic path on the waterfront along statues of death. This weekend start on October 22 and covers a variety of events ranging from Tarot introductory classes, and the “I Scream Social.” Then there is “Nightmare before Christmas Sing-a-long.”, a rare experience indeed! No Halloween is complete without paying a visit to a haunted house! St Helens ‘Nightmare on the Main Street’s Haunted House’ is just what you need to complete your Halloween experience. Rent a car in Oregon for St. Helen’s & explore the town at your own time! St Helen’s is about 25 miles from Portland & can be reached using U.S. Route 30, which is the best route to reach this magical town. Hiring a car is what the majority of travelers do. It certainly elevates the feeling of relaxed travel and allows you to make your own schedule. Compare the deals by the best car rent suppliers: USA Cars Rental has tie-ups with almost all the big brands in the country including names like Ace Rent a Car, Thrifty, Alamo Rent a Car, Enterprise and National Rent a Car. Car hire agencies which have offices in St Helens: Enterprise is the only car rental agency which has its office within Halloween town. Other popular states that you can visit this Halloween: Las Vegas, Florida, Miami & New Jersey, to name a few. New Jersey is best known for ‘Sleepy Hollow’, the place where the legend of the headless horseman came into being. If you would like to dress up and participate in Halloween Parade, Los Angeles is the place for you. In Florida, there are a lot of places that you can visit, like, various theme parks in Orlando or the Key West Fantasy Fest. Depending on whether you are planning to visit Halloweentown first or at the end of your trip, note that in addition to the normal rental, with us you can also book a one-way if you want. Most popular car rental types: SUVs, minivans, and luxury cars especially sports or convertibles are the most booked car-types during Halloween (especially the minivans and the SUVs – families love them!). Fun Facts about Halloween – Did You Know? Halloween’s most popular symbol is Owl. More than 2000 years old, Halloween’s roots go back to the Celts who were native to Britain. Halloween is the third biggest celebration in US after Super Bowl Sunday & New Year. The celebration was brought to America via immigrants from Europe. They used to celebrate it around a bonfire, sharing ghost stories, accompanied by singing and dancing. Every culture associates its festivals with specific colors; black and orange are the colors of Halloween, where black symbolizes dark, and orange, the fall harvest. People use to play practical jokes on Halloween, but when this turned really ugly, to dissuade it, the ‘trick or treat’ was started as a movement for kids in the 1930s.